You’ve made an investment in your property. Keep your sprinkler system in tip-top shape and you’ll see the results in a thriving lawn, year after year. Whether or not you chose Rock Solid for a sprinkler irrigation installation, make us your choice for annual maintenance or repair by certified professionals. Spring start up. After a long winter, we’ll turn on your sprinkler system, calibrate timers, adjust water flow settings and install fresh batteries. We’ll also inspect hardware such as sprinkler heads and filters. Your sprinklers will be ready for the summer season ahead. Winterization, aka sprinkler blowout. Come fall, water left in the system can freeze and burst pipes or break sprinkler heads. To avoid this costly damage, a certified irrigation contractor will “blow out” your sprinkler system and prepare it for the deep freeze. Only $225 through February 28!BUY NOW! Maintenance at a discount. 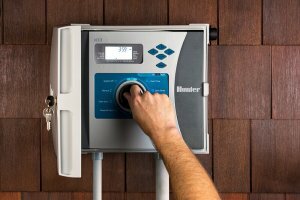 Need to fine tune some settings or make water pressure adjustments? A necessary sprinkler repair? A service contract entitles you to priority scheduling, two service calls at no charge, and 10% off parts and labor. Upgrades. As your system ages, we’ll modernize it with the newest water-saving parts. New technology is always being developed, with water conservation as the goal. Seasonal transitions. Spring start up and winterization to keep your system running smoothly. Call us today at 763-398-0739 to get your questions answered or schedule a FREE, no-obligation consultation.